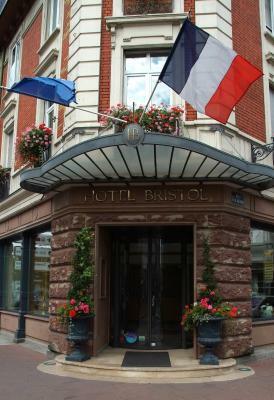 Lock in a great price for Hotel Bristol – rated 8.8 by recent guests! 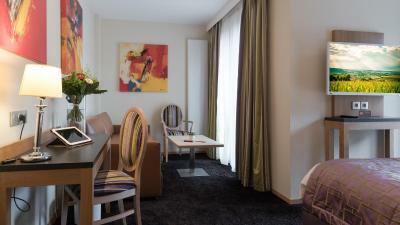 Room clean and spacious, breakfast very good and the staff was very kind. Beautiful room with classical decor. Big and comfortable bed, excellent acoustics provided by all the textiles in all sorts of fancy fabrics. Good noise and temperature isolation due to the updated windows with good sealing and motorized blinds. Friendly staff. Easy and cheap parking. Just a few meters from the tram. The excellent quality of the finish of the decor in the room. The very secure parking arrangements. The hotel is located near the town center and the tram stations are nearby. The food served (breakfast and dinner) was good. Private parking, airconditioned room and walking distance to the centre! Everything was excellent. The staff was kind and helpful, the room was spacious and clean and the breakfast varied and tasty. The hotel is situated in a good location. Good location with a lot restaurants around. The Turkish restaurant is only 100meters away, highly recommended after 8pm. Quite, food is descent compare the price. Parking area is within the facility therefore super safe with only 4euro a night. Staff also great though their English can be better. 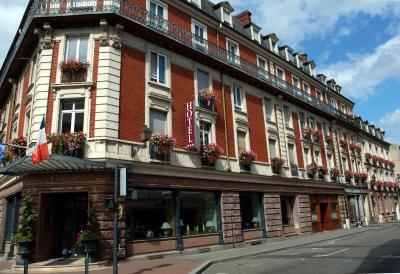 The B and B was situated very near Avenues de Champagne the famous row of Champagne Houses. Moet de Chandon was just a short walk away.The owner knew I was coming close to the hotel and personally stood in a street parking place in front of the hotel! to hold it for me! Amazing! A glass of wine (or 2) on the veranda was relaxing after an 8 hour drive. Mark spoke perfect english and was very pleasant and helpful. He also carried my suitcase to the room since I couldn't navigate the stairs in my condition The food was outstanding and the bed comfortable. 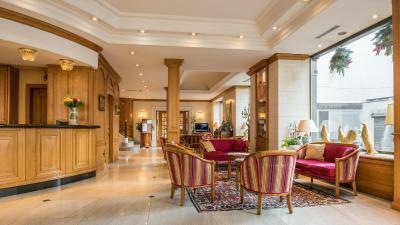 Hotel Bristol is an elegant 3-star hotel located in the city center of Mulhouse. It offers an on-site restaurant and free WiFi. Rooms are spacious and comfortable and some have a private spa bath. A buffet breakfast is served daily. Guests have access to a private parking on-site at an extra cost. 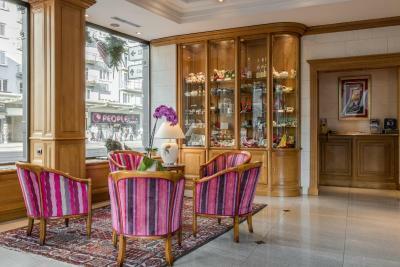 Hotel Bristol enjoys a very central location near the pedestrian and shopping streets of Mulhouse. It is near the tram station and National Automobile Museum, and just 1,650 feet from the Exhibition Center. 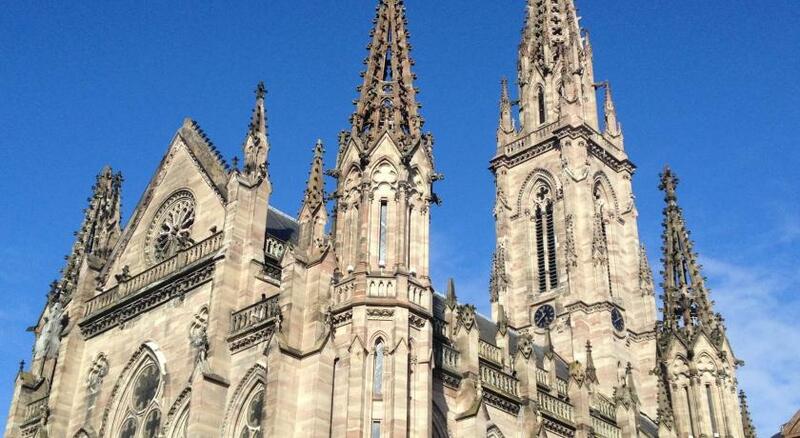 This property is also rated for the best value in Mulhouse! Guests are getting more for their money when compared to other properties in this city. 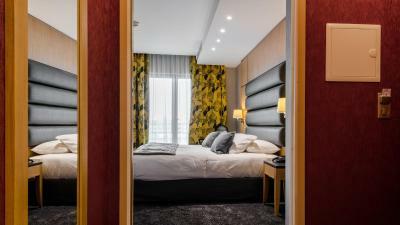 When would you like to stay at Hotel Bristol? 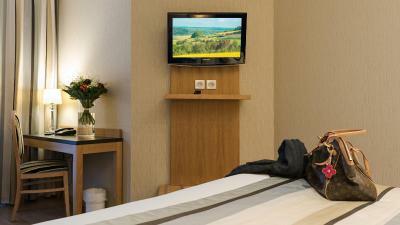 Free Wi-Fi access, satellite TV and a minibar are provided in this room with a private bathroom. Private parking is available on site (reservation is not needed) and costs EUR 4 per day. 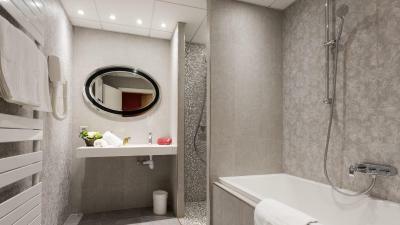 This room includes a satellite TV and its private bathroom is fitted with a bathtub. 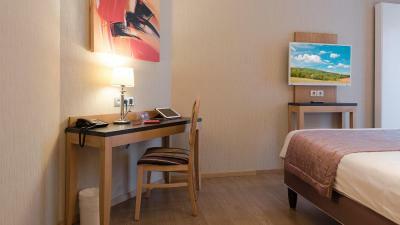 Free Wi-Fi access, satellite TV and a minibar are provided in this room with a bathroom. This room is spacious and has a marble bathroom with a whirlpool bathtub. 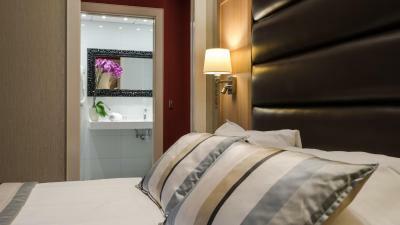 Free Wi-Fi access, satellite TV and a mini-bar are provided in this room with attached bathroom. - a 4-course Christmas Eve dinner for 2 (drinks excluded). The studio has a kitchenette and an private bathroom. House Rules Hotel Bristol takes special requests – add in the next step! Hotel Bristol accepts these cards and reserves the right to temporarily hold an amount prior to arrival. Please note that the private parking is located at 5 rue d'Illzach. You can access to it directly from hotel reception. We have stayed here before and found the rooms very clean and comfortable. The breakfast is very good and the staff very helpful and friendly. It’s right in the centre of Mulhouse and has secure parking which suits us. Breakfast choice is narrow, e.g. no bacon, no smashed eggs, eggs on a boil-them-yourself basis in a special equipment. We did not think about turning up the heating upon (late) arrival and the room could do with a few more degrees during the night. Humidity in the top parts of the shower cabin. 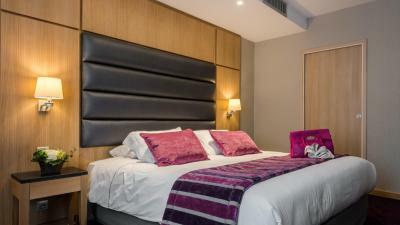 Good central location, accessible parking, friendly staff, large room, overall good comfort. Bathroom is big but not really thought out. There are double sinks in a not so big countertop, making the space feel cramped. To top it off, the hairdryer is hung on the wall and protrudes a fair amount blocking access to one the sinks. No facility for a hot drink when kitchen closed. Unfriendly reception staff especially the older woman who was on the desk on our arrival. Ugly Christmas decorations still up round the hotel entrance. Good breakfast - plenty of good food. Charming staff in restaurant. Clean well appointed rooms. Comfortable bed.